Private, secluded villa faces Florida Bay in view of the fabulous Everglades. Located in a lush tropical hammock in a quiet residential area (rare). The villa is approx. 50 feet from the water. The property contains a wading beach and a free marina with night lights, power and water. The villa itself comes with a fully-equipped kitchen, washer and dryer, linens, queen and king beds, Cable TV, VCR, and a Florida room for dining. Windows in the living room and bedroom cover two thirds of the wall giving the feeling of the outdoors being in. Beautiful glass block shower in good-sized shower. This is a small house, near the water, no high-rise, no canal, and no density of people problem. This is a laid-back atmosphere for those who desire it. We are Bob and Phyllis Mitchell and have loved the Keys since we moved to Florida in the late 60's. I was an airline pilot for 25 years and at the same time worked as the Marketing Manager for Florida Sportsman Magazine. I am now retired. Phyllis is a retired teacher and professor who now works as a volunteer to a long list of organizations from the local parks to looking out for abandoned or abused children in the Keys. We both are very community involved and are on many Village committees. We love fishing, especially when our grandchildren are visiting. We did many years of offshore fishing and after that many years of backcountry but are now slowing down on that. Our big love is plants and gardening and we love to keep the Villa property native and beautiful as well as our nearby house on an acre. We will be thrilled to give you a tour of the local plants and what we have done with the Villa property and ours. We have loved the Keys since we moved to Florida in the late 60's. Within a few years we discovered the most delightful Keys hideout in Islamorada that is now the Keys Villa we own and rent. At the time it was a small non-typical motel with just a few units. The Villa is a small house on the property, comfortable for four people, and is free standing on an acre property with a free protected Marina. We keep it clean, constantly up-dated and remodeled, and very comfortable for our guests. The small town laid back atmosphere was very attractive but it took us until 1984 for this villa to come up for sale. There are three other rental accomodations, owned by friends, on the property so it is very quiet. We love it so much that we bought the property two doors north where we now live. We are nearby for your needs but not there unless you need us. The property is so quiet with so few guests that folks naturally socialize. Nightly visits to the bay for the sunset, drinks and snacks become a norm. Maybe half the guests to the property are return people for years. A big hit is the occasional visits by an octopus which darts around changing colors as she passes over the bottom. Years ago one was feeding on the shrimp in my bait bag and when the bag was taken away from her she started putting her tenacles up on the dock looking for more. Soft heart, I fed her a few. We had an amazing time! Bob couldn’t be a better host. He is so accommodating and just the nicest man. We saw so much wildlife off the docks...nurse sharks, dolphins, eels and a manatee. The sunsets were breathtaking! Thank you Bob for sharing your beautiful villa with us. The marina was nice, calm, easy. The villa was very clean and updated. First four star review we have ever had in 30 years of ownership. They didn't mention any problem. I suspect they were not happy about the strong weather front that blew in Thursday with 35 MPH winds and rain. They packed up and left early. The perfect spot in the Keys. Owners are fabulous! We are so thankful to Bob for helping make our Keys visit perfect. 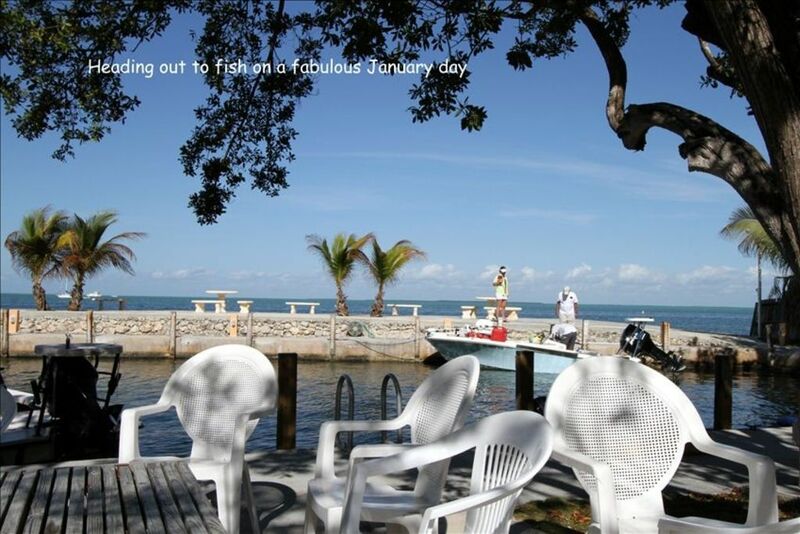 The location of the villa in Islamorada is amazing, you can walk to numerous shops, bars and restaurants. We loved being able to moor our boat in the marina and enjoyed many peaceful afternoons relaxing and enjoying the bayside views and sunsets from the dock. The villa was very comfortable and had everything we needed. We can't wait to return. We work to make each guests stay a wonderful vacation. We are nearby to help out their every need. It's a joy to have such great folks. I enjoyed everything about the stay in the Villa. It is a beautiful place and the view out of the living room at Florida bay is fantastic. The Mitchel’s are really great host. I would give this stay a 100+ on a scale of 1-10.